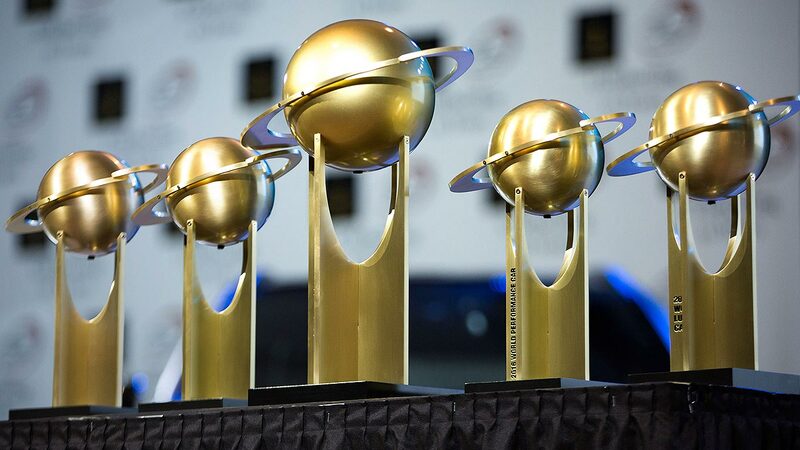 The World Car Awards is the largest automotive awards programme on the planet. 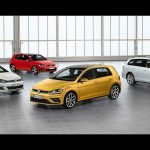 Winning World Car of the Year is a big deal for auto manufacturers – so all eyes will be on the just-released list of finalists for the 2017 prize. Here, we’re revealing which 10 cars are in the running to be World Car of the Year 2017. It’s not just the overall World Car of the Year finalists that we’re revealing here, either. 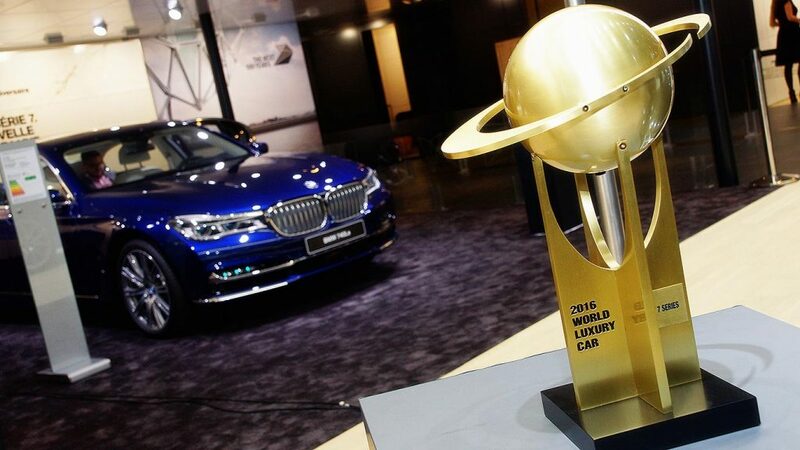 The awards scheme, that’s been established for more than a decade, also includes prizes for World Luxury Car, World Performance Car, World Green Car and World Urban Car. There’s also a World Car Design of the Year prize. The sleek new Audi A5 Coupe has been a bit of a slow-burner, but its elegant, curvaceous lines are now starting to find favour. The high-tech new chassis is excellent and shows off its high-performance side in the 354-horsepower S5. This is a new entrant for Audi – a small crossover SUV designed to compete with other tiddler machines such as the Renault Captur and Nissan Juke. Styling is a break from the Audi Q norm, and being based on the A3 hatch means it drives tidily. Honda’s 10th generation new Civic has recently been rolled out in hatchback guise, joining the sedan and coupe models already on sale. It’s a big step on from its predecessor – is it enough to earn it a World Car Award gong? The Jaguar F-Pace was a radical new model for the British sports car company – its first-ever SUV. The Ian Callum-designed lines have been very well received and the Jag also drives extremely well. 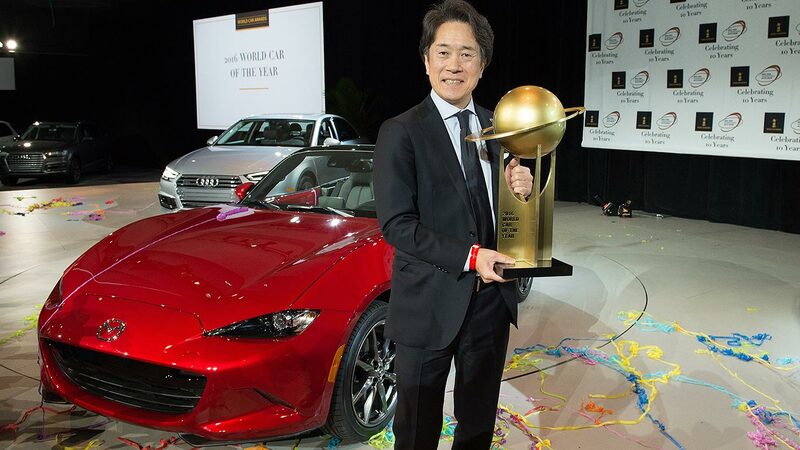 Will you be placing a bet on it winning the World Car of the Year prize? It’s safe to say the Skoda Kodiaq seven-seat SUV has been exceptionally well received in Europe. There’s even talk of it now going on sale in the United States. A landmark car from the Czech brand, it would be a very deserving victor. The most radical Toyota in years, there’s no missing the C-HR on the road. There’s a good car beneath the stylish lines as well – but will its weak engines let it down? The first-ever Bentley SUV, the Bentayga remains controversial for some, but initial sales suggest rich buyers can’t get enough of it. Impeccably finished inside and supremely refined, it’s expensive, but you certainly get what you pay for. Is this the best new BMW there’s been in years? A brilliantly well-conceived machine, the latest 5 is peerless in almost every respect. The fact it’s a relatively attainable luxury car will also find favour with the judges. Certainly, one to watch. Hyundai has made its first-ever luxury car, and the Genesis G90 is as significant today as the launch of the original Lexus LS was back in 1989. Thoroughly convincing, it’s a superb luxury car with quality, refinement and the feel-good factor in abundance. This or a Mercedes-Benz S-Class? That’s a serious question. Like BMW, Mercedes-Benz pushed the boat out in developing the new E-Class. It looks svelte, it’s good to drive and the high-tech interior impresses. Safety standards are also world-class: it’s truly the S-Class of executive cars. Volvo’s transformation continues. First the XC90 SUV, now the S90 sedan and V90 wagon. Both are wholly convincing luxury cars that can finally go eye-to-eye with BMW and Mercedes-Benz. But are they good enough to scoop the World Luxury Car gong? The World Performance Car category is always an exciting one. 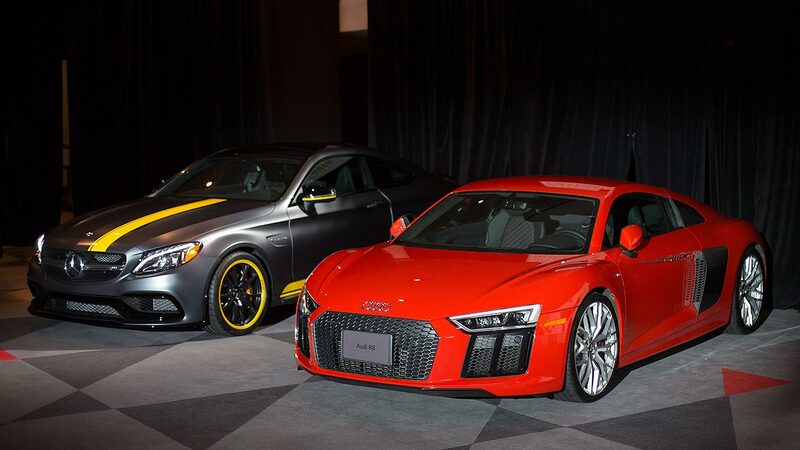 Needless to say, this year’s list of five finalists contains some thrillers – one of them will follow on from last year’s winner, the Audi R8. Aston Martin has been reborn and the DB11 is the sports car that will take it into its ‘second century’. All-new from the ground up, it’s an outstanding performer, while Mercedes-Benz-sourced electronics bring the interior bang up to date as well. A long time in development, the Honda / Acura NSX is at last now available. And what a car it is, all high-tech thrills and super-clever abilities. It may not move things on in quite the same way as the original, but it’s nevertheless a significant achievement from Honda. The World Green Car prize is back once again for 2017. Last year, the Toyota Mirai aced it. Who’s in the running this year? The hydrogen fuel cell Honda Clarity has been a long time coming but finally it’s on sale in North America. It rolls out in Europe soon too. Is this the future of zero-emissions electric-drive motoring? Hyundai has created a very clever range of green cars with the Ioniq range. Hybrid, plug-in hybrid and full electric are all offered, in the same five-door bodyshell. This keeps costs affordable and ensures eco buyers can choose exactly the right model for their driving style. Will this earn it World Green Car-winning points in 2017? With the Model X, Tesla aims to do in the SUV sector what the Model S has done in the luxury car sector. Proving you can have an all-electric SUV with a long range and supercar performance, it’s another striking model from the cool premium car firm. 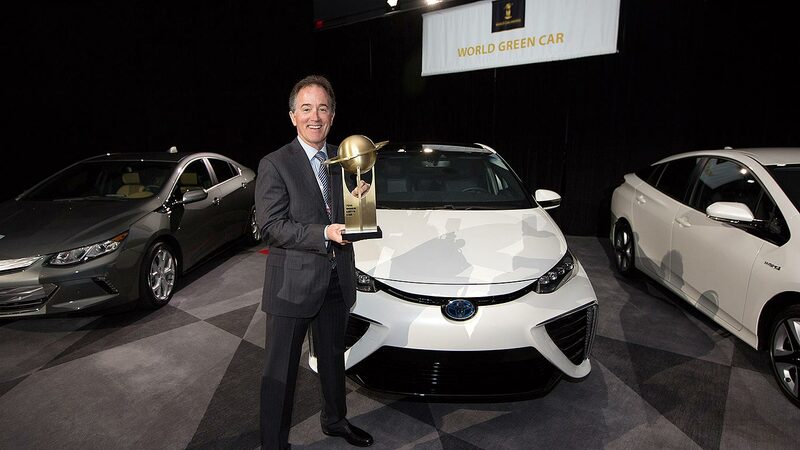 Last year, the Toyota Mirai fuel cell car won the World Green Car prize. Can its plug-in hybrid sibling, the Prius Prime, do the same in 2017? One thing’s for sure – the styling is certainly finding more friends. This is a new category for 2017, introduced because more than half the world’s population lives in towns and cities – a figure that’s set only to grow. Cars must be under 4 metres long and be “safe, quiet, clean, driver-, pedestrian- and cyclist-friendly, comfortable, affordable, flexible and to be capable of reaching motorway speeds”. BMW’s ingenious and fantastically clever carbon-fibre i3 has been upgraded with a big new battery. Dubbed 94Ah, the extra capacity gives it a range of almost 200 miles. Is this enough to tip the little i3 over onto car-buyer consideration lists? The old Citroen C3 supermini was a dreary and slightly dreadful machine. What a turnaround there’s been with this all-new one. Inspired by the modernist C4 Cactus, it looks delightful and the fresh-faced image carries through into a clean, crisp on-road drive. 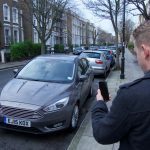 You can even get onboard tech that takes selfies as you drive – ingenious. Another model that’s been transformed. The old Ford Ka was woeful, a pale imitation of the original. Ford has rethought things with this model, which gets five doors for the first time. Derived from the top-notch Fiesta platform once again, it’s well-priced and, while not as radical as the original, is nevertheless a well thought out new city car entrant. 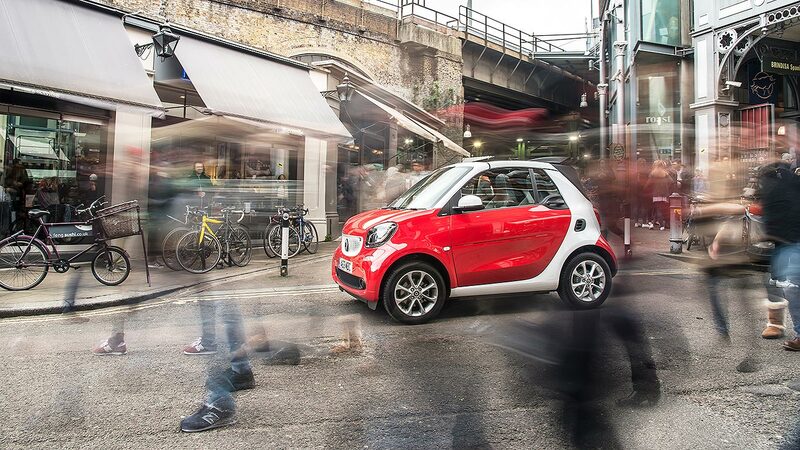 The Smart Fortwo remains one of the most authentic city cars on sale. Super-short, with a turning circle the equal of a London black cab, this cabriolet model brings open-air satisfaction to the table. Daimler integrity costs money but brings further feel-good reassurance. Small car master Suzuki has done it again with the Ignis. A city car infused with crossover styling and even some cues from the original Suzuki Whizzkid, it’s another perfectly-conceived city star that is affordable to buy and well in with a shot of winning the inaugural World Urban Car prize. A committee of top car designers has drawn up the shortlist for the 2017 World Car Design of the Year award. Now it’s up to the jurors to select which they think is the finest. 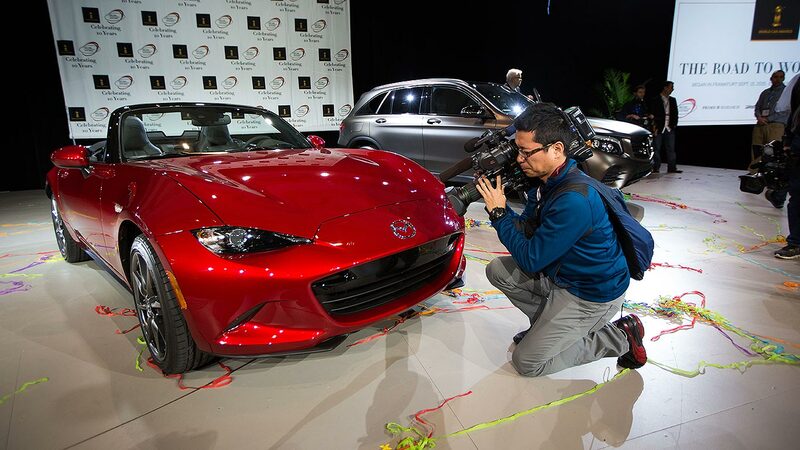 Once again, there’s a five-car group to choose from: which will follow the 2016 winner, Mazda’s MX-5? The designer of this car’s predecessor reckoned it was the most beautiful car he had ever created. Will the World Car Design of the Year judges agree that its successor is also worthy of such high praise? Ian Callum proved that you can make a convincing Jaguar SUV with the F-Pace. It’s classy, cohesive and exciting, and as authentically Jaguar as the F-Type coupe it references in its name. This is why we think it’s in with a good chance of winning. Mazda has given the SUV sector a subtle dose of sports car excitement with the CX-9. It’s an elegant, understated vehicle, whose crossover looks grow on you, not least because they lack the dumpiness of previous large Mazda crossovers. Over the years, large two-door coupe versions of the S-Class saloon have proven unconvincing. Mercedes-Benz finally nailed it with the S-Class Coupe, and now it’s followed it up with the glorious S-Class Cabriolet. Our design experts have ensured it’s one to watch in 2017.